The Canning Doctor: Another New Cookbook! Nana and Papa brought me two cookbooks! This one has some nice flavor combinations I wouldn't have thought of myself. 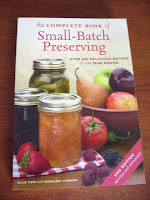 And there are some good pickle recipes I can't wait to try!